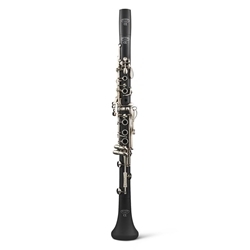 The Alpha Clarinet is crafted from an ideal blend of synthetic material for maximum resonance and durability. Designed as the optimal indoor and outdoor student clarinet, it's at home in the classroom, on the concert stage, or the marching field. With its stable, resonant, and lightweight synthetic body, water-resistant black Valentino pads, durable and ergonomic key work, and adjustable thumb rest with neck strap ring, many hours of enjoyable practice–and performance–are ahead.